The gift giving season is here, which can be tough if you’re on a tight budget. Luckily, there are a ton of things you can easily make yourself that will help you check off your list with ease. These ten ideas won’t just help you save a whole lot of money on the holiday season, but they’ll also add some fun to your free time. You might be surprised by how easy it is to create the perfect gift for everyone on your list without spending a small fortune. So, this holiday season, have fun crafting and preparing the ultimate gifts for your friends, family and colleagues without going over budget. Ornaments are one of the easiest options when it comes to the holidays. You can purchase blank or even transparent ornaments in bulk, which will allow you to make gifts for a wide assortment of people. The best thing about ornaments is you can do just about anything with them. For starters, you can create crafts with the kids, which makes a great option for grandparents. Another option is to paint the ornaments. You can do everything from Harry Potter and superheroes, to traditional holiday images or simple words. Clear ornaments can be filled with pictures, clip art, glitter and more. If you want to save even more money, you can make ornaments out of items found around the home. For instance, pinecones can be transformed into cute animals or even a snowman. You can use popsicle sticks, toilet paper rolls and so much more. Another option is to make your own dough for handprints, paintings or words. These make great ornaments when dried and painted. Another fun craft to add to the holiday list is a snow globe. These make great collector items and can work to decorate the home during the holiday season. You can make snow globes out of a wide assortment of items too, which will give you so many options to work with. One of the cheapest options is to use mason jars for the globe. These items are especially easy to work with too. Once you have the globe aspect of your gift ready then all you need to do is figure out what you’re going to put into it. You can use classic holiday items like snowmen and Santa, or you can personalize the experience with small toys. You can also add in fake snow or add some pizzazz with glitter. Have fun with the gift though, so it’ll suit the recipient’s personality. If you’re not really sure what a person is interested in, then a treat in a jar can go really far. In fact, these gifts are especially great for colleagues. You can make all sorts of treats too, which will give you a variety of options to work with. You might consider purchasing mason jars in bulk to help with this project. Once you have your jar, look up a recipe to use. You might want to add in items for cookies, brownies or hot cocoa complete with marshmallows or peppermint. If you love baking then go ahead and bake cookies, brownies or whip up some candy for you jar. Once you’ve added in ingredients, then seal your jar and start to work on the exterior décor. You can keep it simple with a bow or go all out by turning the jar into a reindeer, Santa or snowman. Ladies on your list might enjoy some body products that have been crafted with lots of love. You can really go all out for these treats too, which will allow you to learn new crafting techniques. One of the more popular option is bath bombs. These body products are very popular on the market right now and they’re a breeze to make. You can even customize them for children with little toys inside. If you aren’t feeling the bath bombs, then homemade soup might be up your alley. You should also consider sugar scrubs as well as body balms to add to the fun. You can make a wide assortment of scents too, which should suit everyone on your list. With some fancy wrapping, your gift is bound to be a hit with anyone that receives it. Anyone that loves a warm beverage is bound to be excited about a customized mug. This gift offers so many options too, which will allow you to have some fun. You should consider buying mugs in bulk or on clearance if you do plan on gifting many mugs though. Once you have your mug, you can paint just about anything on it. A few ideas might be the recipients home state, favorite character, text and so on. Your coworkers might appreciate a mug that features their name, so they can use it at work. Once you’ve painted your design seal it and leave it to dry. You might also wash the mug before gifting to ensure that your hard work isn’t going to wash off. Mugs can be presented in wrapping or you can add to the gift with a hot cocoa mix, some delicious tea bags and so on. Helping someone make their home smell incredible is a great gift that is also fun to make. One of the most popular options to try is a candle as you can dress it up in so many fun ways. However, these days, many people are using wax warmers, so you might also consider this option. If you have ice trays that allow you to create fun shapes, then you can easily spice up your gift in this way. Another great option is to make your own potpourri. You can try so many different scents with this, which won’t cost you a small fortune. Best of all, you can create fun gifts to present your gift in. Photos are always a treasure, which is why a personalized picture frame is a great gift for loved ones. You can make the frame yourself out of supplies you have lying around, or you can purchase a cheap frame and add to it. If you like to keep things easy then decorating the frame to suit the holidays is pretty simple since decorative items will be on sale and in abundance. However, you can also use scrapbooking supplies that you have on hand to decorate for other holidays or personally traits. Once the frame is complete, add a picture to make the gift even more special. If you’re working on a gift for grandparents, then a Santa photo or family portrait for the holidays is always a great option. Hitting the kitchen is a great way to bring some cheer to those on your gift list. You might have a lot fun with this craft if you love to bake too. Of course, since it is the holidays you might want to stick with the sweet treats that everyone seems to crave. Cookies, cakes, and sweet breads are some of the best options for holiday gifts. 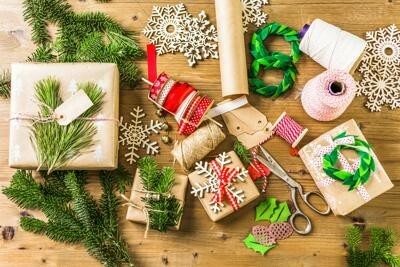 You can easily decorate these items to suit the holiday season too, which will make the wrapping look extraordinary. However, you might also consider baking some delicious breads that can be used for meals during the season. These fresh breads are hard to come by now as most people purchase bread from stores. No matter what baked goods you choose to present, make sure to add some special love to the gift wrap in order to make your treats a home run. Having a cocktail or two is a popular part of the holiday season. That is why many adults will appreciate a drink mixer for the holidays. You can make so many different drinksahead of time, which will help liven up parties in no time. If you don’t want to wrap this gift up for someone on your list, then you might consider presenting it as a hostess gift during the holiday season. There are many mixer recipes online, so you can choose from a wide assortment to suit different people. You might also consider reusing your old wine bottles for the gift. You can easily clean up bottles to look festive and beautiful with your mixer stored inside. Sometimes, the only thing we can think to get for some coworkers or loved ones is something that has to do with their job. A customized office set can be one of the best options for these people. You can have a lot of fun with this though. For instance, you an customize pens by decorating them with images, yarn and so on. You might also consider making a special case to store your festive pens. You can customize a drink cozy as well as covers for most things that might be found in the office. A stylish billboard is a breeze to make too and can be customize to suit needs and interests. Another fun option is to purchase a succulent and decorate the container for the recipient. There are so many things you can do for the office, so browse around online for ideas for each individual person on your list. The holidays don’t have to be all about spending money. In fact, you can create something special for next to nothing for everyone on your holiday list. These simple ideas will help you get started on your holiday crafts. Before you know it, you’ll have a stack of goodies that will bring smiles to so many over the holiday season.